The apoptosome is a multimolecular complex assembled around the adaptor protein Apaf1 upon mitochondria-mediated apoptosis. The formation of the apoptosome needs the presence of ATP/dATP and cytochrome c in the cytosol and triggers the activation of caspases which – in turn – drive cell demise. Apoptosis plays a key role in the homeostasis of all multicellular organisms and, indeed, with regard to its essential components the apoptosome is evolutionary conserved. However, higher eukaryotes, according to their complexity, have evolved more complicated and finely tuned mechanisms for controlling apoptosome activity. 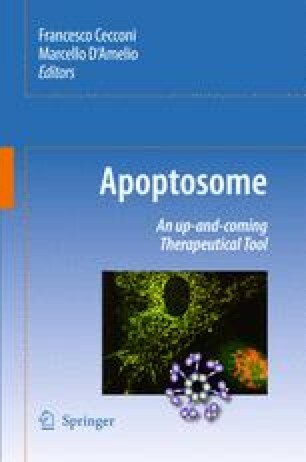 Since apoptosome dysfunctions can cause many human diseases, this complex is also a relevant molecular target in biomedicine and the understanding of its structure and its regulation is matter of great interest for scientists.